DEUTZ engines are worldwide well known because of their quality and reliability. The German manufacturer has a tradition of 140 years in engine production. The product range contains air-, water- and oil-cooled engines from 10 kW up to 500 kW power. 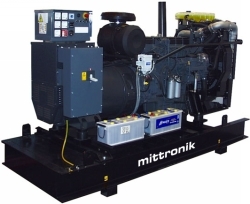 MITTRONIK offers power generators with slow turning DEUTZ diesel engines from 13 up to 250 kVA power. The MDA generators are equipped with extra reliable air-cooled DEUTZ engines which are inexpensive and thus attractive for applications where the sound level is not important. The sound proof generators of the MDL / MDW series ar available optional with extended fuel tanks (double-walled) in the base frame with a volume from 225 to 2.100 liters. Power Generators with oil-cooled DEUTZ engines have extra long service intervals (1.000 h, standard: 500 hours). Operationg at 100% bio-diesel (EN 14214) is possible. High quality power generators with DEUTZ engines (Made in Germany) and Bosch starters. The attractive super silent enclosures are weatherproof and well below the permitted noise emission standards significantly.